Life is made up of a series of complex organic molecules, including sugars. A team of astronomers led by researchers from the Niels Bohr Institute, have now observed a simple sugar molecule in the gas surrounding a young star and this discovery proves that the building blocks of life were already present during planet formation. The results have been published in the scientific journal Astrophysical Journal Letters. 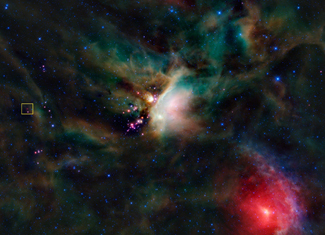 very young star located in the left part of image (yellow box). 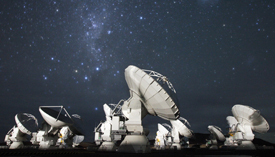 The star was observed with the new large international telescope, Atacama Large Millimeter Array (ALMA) in northern Chile. The ALMA telescopes are able to zoom in and study the details of newly formed stars and their rotating discs of dust and gas, which subsequently clumps together and forms planets. Among other things, the astronomers would like to investigate the gas for the presence of water vapour and examine the chemical composition for complex molecules. “In the protoplanetary disc of gas and dust surrounding the young, newly formed star, we found glycolaldehyde molecules, which are a simple form of sugar. It is one of the building blocks in the process that leads to the formation of RNA and the first step in the direction of biology,” explains astrophysicist Jes Jørgensen, Associate Professor at the Niels Bohr Institute and the Centre for Star and Planet Formation at the University of Copenhagen. He explains that at first the gas and dust cloud is extremely cold (only around 10 degrees above absolute zero at minus 273 degrees C) and simple gases such as carbon monoxide and methane settle on particles of dust and solidify as ice. Here on the particles of dust, the otherwise volatile gases come close to each other and can bond together and form more complex molecules. When the star has been formed in the middle of the gas and dust cloud, it emits heat, and the inner parts of the rotating cloud surrounding the star is heated to around room temperature, after which the chemically complex molecules on the particles of dust evaporate as gas. This gas emits radiation as radio waves at low frequencies and it is this radiation that researchers can observe with the ALMA telescopes. The star is located only 400 light years from us – so, seen in an astronomical context, it is right in our own neighbourhood. With the very high resolution of the new telescopes, researchers now have the opportunity to study the details of the dust and gas clouds, and in addition to the sugar molecules the researchers also saw signs of a number of other complex organic molecules, including ethylene-glycol, methyl-formate and ethanol. 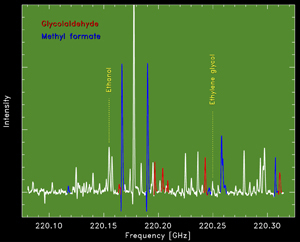 Observed spectrum from the young protostar IRAS16293B. “The complex molecules in the cloud surrounding the newly formed star tell us that the building blocks of life may be among the first formed. One of the big questions is whether it is common that these organic molecules are formed so early in the star and planet formation process – and how complex they can become before they are incorporated into new planets. This could potentially tell us something about the possibility that life might arise elsewhere and whether precursors to biology are already present before the planets have been formed,” explains Jes Jørgensen. Astronomers have for the first time found glycolaldehyde molecules around a young sun-like star.